This article incorporates text from the Dictionary of Pali Proper Names by G. P. Malalasekera, a publication now in the public domain. Maudgalyāyana (Pali: Moggallāna; Chinese: 目連; pinyin: Mùlián; Wade–Giles: Mu4-lien2; Japanese: 目犍連, Mokuren or Mokkenren ; Sinhala: මහා මොග්ගල්ලාන මහ රහතන් වහන්සේ ), also known as Mahāmaudgalyāyana or Mahāmoggallāna, was one of the Śākyamuni Buddha's closest disciples. A contemporary of famous arhats such as Subhūti, Śāriputra, and Mahākāśyapa, he is considered the second of the Buddha's two foremost disciples (foremost in supernatural powers), together with Śāriputra. He was born in a Brahmin family of Kolita. Varying accounts in the Pali Canon show Maudgalyāyana speaking with the deceased in order to explain to them their horrific conditions and give them an understanding of their own suffering, so that they may be released from it or come to terms with it. Maudgalyāyana was able to use his powers of mind-reading in order to give good and fitting advice to his students, so they could attain results quickly. 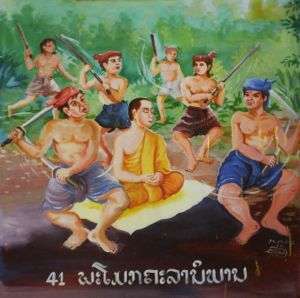 The Martyrdom of Mahā Maudgalyāyana in Kālasilā. Maudgalyāyana's demise came when he was traveling in Magadha. Some accounts put forth that religious cultists stoned him to death, others say it was robbers. The general consensus is that he was killed in a brutal fashion. When asked why Maudgalyāyana had not protected himself, and why a great arhat would suffer such a death, the Buddha said that because Maudgalyāyana had contracted such karma in a previous life (he had murdered his parents in a previous life—one of the five heinous acts taught in Buddhism that reaps the worst karma), so he had no escape from reaping the consequences and had accepted the results. 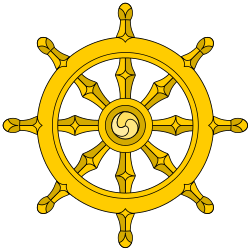 Further, the Buddha stated that even supernormal powers will be of little or no use to oneself in avoiding their karma, especially when it is so heavy. The Ullambana Sutra is the main Mahāyāna sūtra in which Maudgalyāyana is mentioned. The sutra covers the topic of filial piety, and was a discourse given to Maudgalyāyana by Śākyamuni Buddha. Of particular popularity in Japan, Ullambana is the foundation for Obon, which has striking similarities to Confucian and Neo-Confucian ideals in that it deals with ancestor worship. 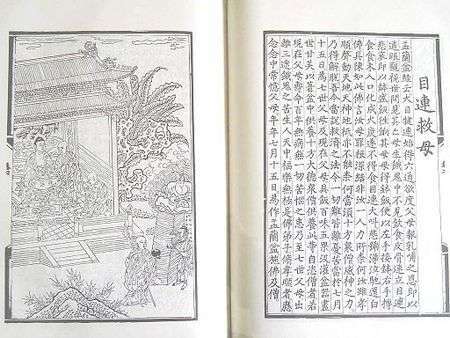 It is for this reason that the Ullambana Sutra is often subject to criticism, and has often been called inauthentic because its Confucian leanings are often at odds with other Buddhist teachings, a question raised by the set of Chinese stories and operas, Mulian Rescues His Mother. In the Lotus Sutra Chapter 6 (Bestowal of Prophecy), the Buddha bestows prophecies of enlightenment on the disciples Mahākāśyapa, Subhūti, Mahākātyāyana, and Mahāmaudgalyāyana. Nichiren Daishonin speaks about Maudgalyayana.